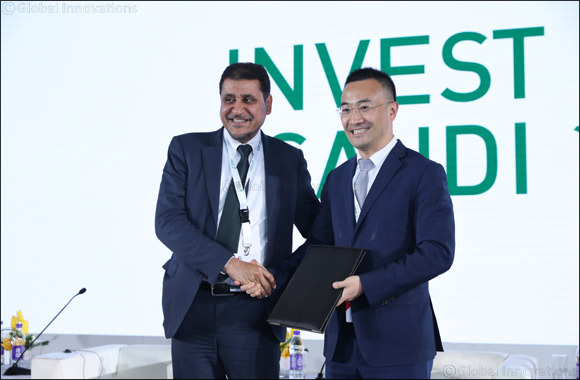 March 18, 2019: Huawei, a leading global provider of information and communications technology (ICT) infrastructure and smart devices, joined the Saudi-Chinese Investment Forum to share its success stories and future goals to drive the Kingdom’s digital transformation through Chinese investment. The one-day event, supported by HRH Crown Prince Mohammed Bin Salman, deputy premier and minister of defense, was hosted in collaboration Saudi Arabian General Investment Authority and the International Cooperation Centre of National Development and Reform Commission in China. The event witnessed the attendance of more than 1,000 decision makers, investors and visitors interested in Saudi market. Huawei’s Vice President, Mr. Mark Xue, joined the first plenary session of the forum under the title ‘Creating A Better Business Environment for Chinese Investors’. The meeting involved the chairman of Royal Commission for Jubail and Yanbu, HE Eng. Abdullah Al Saadan, the CEO of the National Industrial Development and Logistics Program, Eng. Uwaidh Al-Harethi, and the director general of Saudi Industrial development fund, Dr. Ibrahim Almojel. During the session, Mr. Xue explored the development of the Kingdom’s business environment along with success stories of Chinese investment in Saudi Arabia. “Our success in Saudi Arabia today is thanks to the fair and efficient business environment the Saudi government has built with us over the years. We see the Kingdom as our long-term strategic partner, as we aim to fulfill our corporate responsibilities in Saudi Arabia and continue to invest in stable, long-term evolution. During the past 14 years we’ve deployed more than 6,500 field engineers and 4,000 R&D personnel to guarantee the stability of the communications network during the Hajj Seasons in Macca city in collaboration with our local partners,” commented Mr. Xue. According to the Saudi Press Agency (SPA), 35 joint bilateral economic cooperation agreements, worth more than 28 billion US dollars, were signed at the forum between the Kingdom of Saudi Arabia and the People’s Republic of China. Within those agreements, 5 Memorandum of Understanding (MoU) were announced between Huawei and Saudi ministries and companies. The MoUs are a testament to Huawei’s commitment to developing an advanced and healthy digital ecosystem in the Kingdom and its dedication to working alongside Saudi ministries to develop a progressive ICT infrastructure. Doing so will drive the Kingdom’s anticipated socioeconomic growth, while supporting government targets outlined in the National Transformation Programme 2020 and Saudi Vision 2030.
Notable MoU signings at the event included those with various governmental entities, the Ministry of Energy, the Industry and Mineral resources, the Ministry of Communications and Information Technologies, and the Ministry of Hajj and Al Umrah. Other growth-focused agreements were signed with Saudi companies, including the Saudi electricity company, Dawiyat and ACWA Power. These private sector agreements focused largely on the areas of smart city, smart campus, smart logistics, smart education, smart traffic, smart grid, smart security, smart roads and digital transformation for renewable energy etc. The signing with ACWA Power will see the power developer, investor, co-owner and operator apply AI and big data to deliver Smart PV for end users. The arrival of Smart PV - enabled by Huawei - will help accelerate the development of the renewable energy sector while also achieving greater power generation and lower maintenance costs. The implementation of PV can reduce the Kingdom’s dependence on oil by 20-30 percent, while aligning with the economic diversification goals of the country. Huawei’s global vision is to bring digital to every person, home and organization, for a fully connected intelligent world. The company has actively worked to ensure that every corner of the Kingdom enjoys high-speed broadband access and has delivered high-quality connectivity to millions, including multiple government projects. Huawei has also implemented many of the Kingdom’s most innovative and forward-thinking projects to guarantee sustainable ICT development. One example is the activation of an ICT skills competition, which has selected and trained more than 8,000 Saudi ICT professionals through Huawei-run academies to date.